From April to June 2007, 21 artist-run initiatives (ARIs) around Victoria presented a simultaneous program of exhibitions, forums, performances and workshops designed to celebrate the diversity of this network and their contribution to Australian contemporary art. 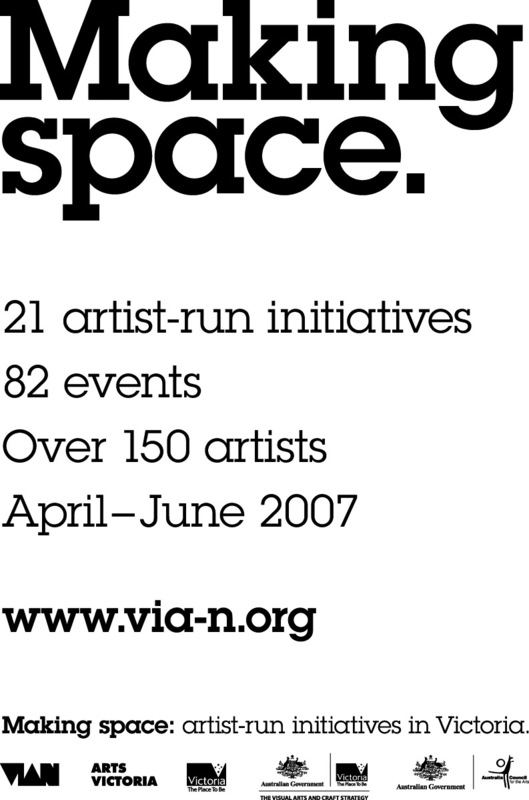 Making Space was developed collaboratively by the Victoria Initiatives of Artists Network (VIA-n) and was initiated by the Australia Council and Arts Victoria. Update: very little information regarding the event itself is available online, as the collaborative platform used to present the project as a group-led undertaking was not maintained, including its website. There is a page for the publication on the West Space site, who provided the isbn and other infrastructure for it (and the shared requirements for the wider project such as financial controls and publicity). Rattling informative and excellent structure of content material , now that’s user friendly (:.